We had a recent birthday here and it was very close to May the 4th, as in ‘May the Fourth (Force) Be With You’ so we decided to host a Star Wars themed party. I spent some time putting together a few simple games for the children. Here are the games and printable links in case you are looking for some theme day ideas this summer for your school aged kids. All the guests came dressed as their favourite Star Wars character. Do you know about sock buns? They helped me pull off the Princess Leia hair. My husband dressed up as Han Solo and made a tin foil belt for his buddy, Chewbacca. I found a Yoda picture online and drew a larger version so the children could play, “Pin the Lightsaber on Yoda”. I taped two pieces of butcher paper together for Yoda and used a piece of bristol board for the lightsaber. We just used tape and re-stuck the lightsaber each turn. It worked well and the kids all wanted to play it multiple times. Here is the picture if you want to make your own. My children and I made Storm trooper masks a few days before the party. These would be fun to do on a theme day. I printed the mask from here and then cut it out. We glued it onto an old cereal box to give the mask a little more strength. We used the strings from inexpensive party hats (they were in our craft bin) and stapled them onto the Storm trooper masks. They worked well. The children at our party ‘trained’ to be Jedi and then they battled the Storm troopers (we gave each Dad a mask to wear). Here are my daycare children playing this game again two days after the party. We made simple lightsabers out of pool noodles and then the kids trained to be Jedi by keeping the balloons off the floor with their lightsabers. In the movie, Luke runs through a natural obstacle course with Yoda on his back as he trains to be a Jedi. Here is a great free printable of the scene. We made up our own indoor obstacle course and the children rode on their father’s backs just like Yoda. Your daycare children might enjoy wearing a backpack with a stuffed animal in it (to represent Yoda) and then running through an obstacle course. Once the children completed their Jedi training they battled the Storm troopers and finally reached the Death Star. Their last mission was to achieve a direct hit on the Death Star and free the galaxy. We made this piñata from a balloon and the classic newspaper and flour formula. A simpler activity would be to have the children throw beanbags or rolled up socks at a hand drawn Death Star picture. You could have the kids trace a large bowl upside down to be the Death Star. Sketch on some rectangles, a line around the middle and colour in a smaller circle in the top half to represent the bull’s-eye. Instead of candy, our piñata had bits of tissue paper we cut up into confetti and a note for each child. Each child had to find their note (in all the confetti that dropped) and read it to search for their prize. We had Star Wars stickers hidden around the house for each child. After all that activity the guests enjoyed some Star Wars themed party food. Here are a few cute ideas if you wanted to do a themed lunch. The children thought it was hilarious when they saw Han Solo frozen in Jello carbonite. 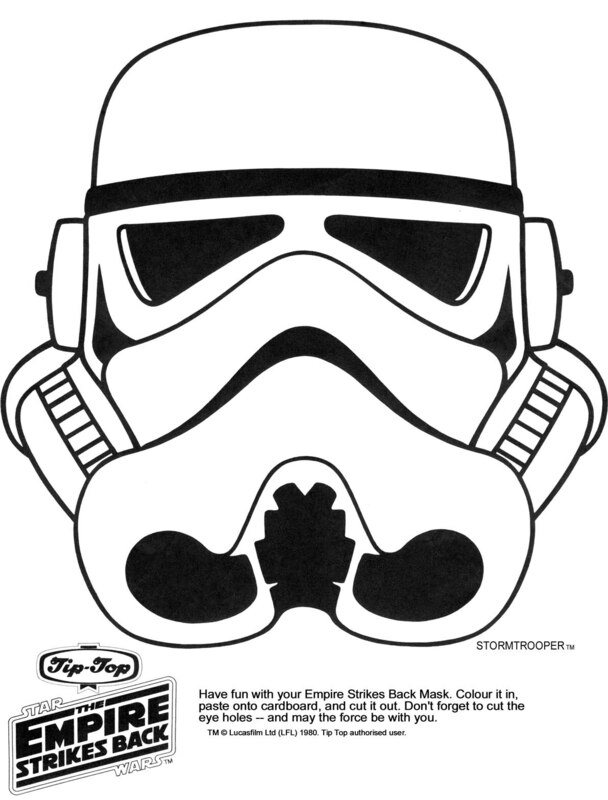 I printed off some Star Wars themed colouring pages so the children could have a quiet activity after eating. Half the fun of a theme day is the planning and preparations beforehand. Take advantage of the children’s enthusiasm and have them plan and decorate their own theme day. All activities can be simplified and many materials can be found in your craft supplies or around your home. May the force be with you when it is time for clean-up!